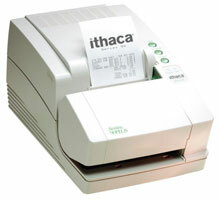 Ithaca 93PLUS - Impact, single-color receipt, journal, slip, & 17-line validation printing, 12.5 lps, parallel interface. Includes auto-cutter & power supply. Order cables separately. See accessories. Color: White. Industry-leading speed of up to 12.5 lines per second. The 93PLUS receipt/journal/17 line validation/slip printer features 12.5 lines per second print speed, dual cash drawer drivers, 71 mm (2.8 inch) print zone width, 6k data buffer, and much more. The Ithaca 93-PAC is also known as Transact Ithaca	ITH-93CXAC	or 93PAC	.